“Migration time for hawks can be full of peril. This Zone-tailed Hawk survived his first summer to migrate to southern Mexico or Central America but he was found on the ground in southern Arizona during the spring migration north. The family that found the bird called a local rehabilitator who administered first aid and transferred him to the Phoenix area for acute care and rehab. He was lucky — the pellet was removed, his wing healed and he completed his rehab quickly. 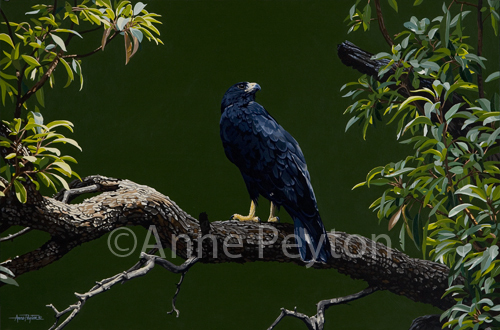 © 2001- Anne Peyton, All Rights Reserved.